There are many advantages of using composite materials for machine components that are in motion. Less weight and higher stiffness means a higher natural frequency. More damping means less vibration and more accuracy. Less weight means less energy to accelerate & decelerate and all attributes together resulting in a higher output. Vibrations and their decay are dependant on the Mass, Stiffness and Damping of the components of the machine as shown by the formula that governs force equilibrium in free vibration contains those three Material Properties. The other elements of the equation are Acceleration and Velocity, which combine into Frequency, and Displacement, which is Amplitude. CompoTech Carbon Graphite Composite Technology has significant beneficial effects on all three material properties. The early tests at CompoTech was of a spindle tube of damped composite comparing with a steel spindle tube of the same dimensions. This test shows the effectiveness of damped composite and the importance of improving all parts in a system. A comparison of Grey Cast Iron with several CompoTech Carbon Graphite Damping Composites. 3 Trials of beams with the same outer sectional dimensions and varying proportions of Composite Modulus and Damping properties were all shown to have lower Amplitudes at higher Natural Frequency. The results show quite clearly that the negative deflection G(f) at the harmonic frequency for the Composite Beams are significantly less than for Grey Cast Iron. 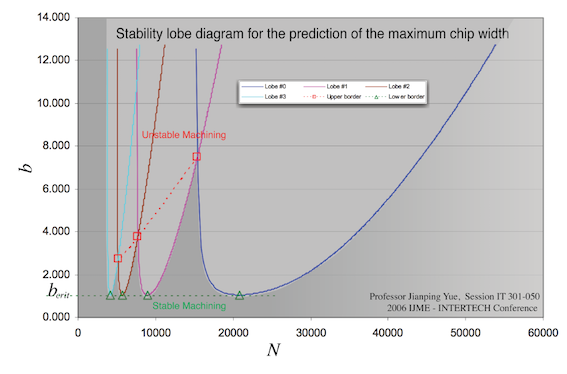 More metal can be cut in one pass by Increasing the Limit Chip and creating a larger area of Stable Machining in the Stability Lobe Diagram. The Limit Chip formula and the results above indicate that the reduced negative vibration will promote a larger Chip size using Carbon Graphite Damping for the Beams of a Machine. In practise it is the interaction of every part of the machine which determines the Stable Area for Machining. In order to maximise the potential offered by Carbon Graphite Damping materials for the machine structure it will be particularly important to pay attention to the interface between the Composite and other parts of the machinery. Of particular importance is the bearing connection between sliding beams and other parts of the machine structure. It is important to look beyond the standard solution and consider all properties of the materials at this interface.